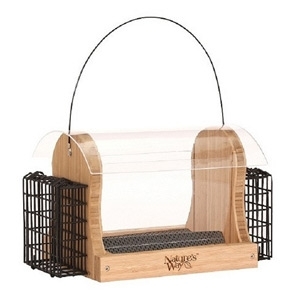 Holds 4 quarts of seed and 2 suet cakes. Made with Solid Cross-ply™ Bamboo. 5 X harder and stronger than Cedar or Cypress. Ultra resistant to mold, bacteria, and squirrels. Double the defense against rotting, warping,swelling, and shrinking. Extra spacing to accommodate large birds like Cardinals and Jays. Removable Fresh Seed™ tray. Rust-free tray lifts out easily for cleaning, preventing mold and bacteria growth. Keeps seed fresh by allowing water to drain and air to flow freely. Diverts seed to feeding area giving birds easy access. Wide opening for easy filling and no spilling. Stay-clear, crack resistant windows and weather shield. Rust-free hardware; stainless steel screws. Vinyl coated wire mesh baskets. Vinyl coated steel hanging cable. Water-based protective stain.